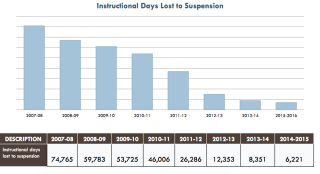 Days lost to suspensions have dropped 92 percent. LA Unified posted a 92 percent decrease in the number of days lost to suspensions as a result of its Restorative Justice program and the district’s new approach to discipline. In the 2007-2008 school year, a total of 74,765 days were lost to suspensions, but that number plummeted to 6,221 in the 2014-2015 school year, according to a report issued last week to the Successful School Climate committee of the LA Unified school board. 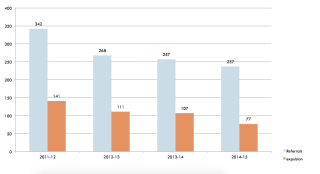 Expulsions were down by nearly half, from 141 in 2011-2012 to only 77 in 2014-2015, according to the district data. 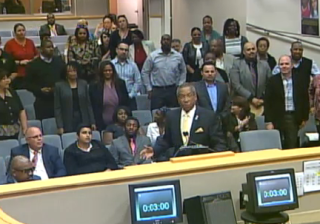 The district voted in 2013 to bring Restorative Justice into all schools by 2020. The data now show that the plan is working, according to Associate Superintendent of School Operations Earl Perkins. Earl Perkins introduces the 45 Restorative Justice teachers. 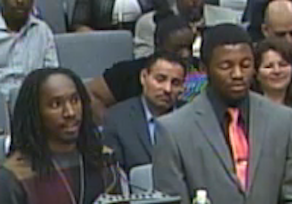 “We are aggressively training school site staff to implement this in more sites,” said Perkins, who asked the 45 full-time Restorative Justice teachers to stand at the board meeting. They started off working at 150 schools (paid for by Local Control Funding Formula money) and now have trained staff at 423 schools (nearly one-third of all district schools). “These are still baby steps, nothing can be fixed overnight,” he said. Other district teachers and staff remain skeptical, because ultimately the new approach makes it harder to remove problematic students from the classroom. Keeping students in class, however, saves the district money that would be lost if they don’t attend. Suspensions and referrals over the past four years. Restorative Justice has been catching on across the country, particularly in urban areas, and takes an approach to discipline that moves away from punishment. It involves restoring a sense of harmony and well-being for those affected by a hurtful act and provides families, schools and communities a way to solve problems as opposed to the student being tagged as the problem that adults must fix. Four students from University High School talked about their experience with Restorative Justice along with Principal Eric Davidson, who said suspensions dropped from 22 to zero in just a year. “A lot of it has to do with just listening,” Davidson said. DeJuan Shelton and Brian Brass from University High. Fellow teammate DeJuan Shelton said he thought things would turn out poorly but was able to sit down and listen. “To hear [the person who stole from them] being honest really opened my eyes to why people do what they do,” Shelton said. The students said that some of their teachers are still not on board with the Restorative Justice practices, and others seem resistant. This week, an article in Cabinet Report noted restorative justice techniques may also boost school climate by strengthening relationships between students and teachers, according to a recent study. The report, “Restorative Justice in U.S. Schools,” from WestEd, found that in 70 percent of cases, teachers’ respect for students improved, and in 75 percent, students’ respect for teachers increased. Overall, approximately 70 percent of participants saw a reduction in suspensions and an improvement in the overall climate at their schools, and almost 60 percent reported increased academic achievement. Many said it was too early in the implementation process to be able to report results. WestEd’s report is based on 169 surveys and 18 interviews across 18 states, including California. Many of the respondents, who practice restorative justice techniques at their schools, were teachers, counselors, assistant principals, social workers and school psychologists – the majority of who had less than 10 years’ experience in leading restorative exercises.